CLASSIC SHOTS -- YOUR bunny! Send us your "classic shots", those pics of your companion rabbit(s) that are true Kodak moments that everyone should see! Current Featured Bunn: "BB and Colt"
And now, for your viewing pleasure, our "Past Classic Shots!" We just can't say goodbye to these great pics, so we gave them their own page! 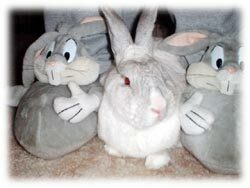 Visit our page dedicated to those wonderful bunnies we've loved and lost to the Rainbow Bridge. Touching stories and pictures memorializing our departed friends. Please feel free to send your bunnies' stories and pictures so that we can remember him/her with you. BUNNY TIP - "CRITTER CASTLE"
Does your bunn like to chew AND hide? Give him or her the Critter Castle! This is a cool bunny "secret fort" made of completely safe cardboard for bunns to chew to their hearts' content, while "hiding" in their very own regal castle! It's even got stairs for them to reach the other floors, including the roof, if they enjoy a penthouse view. Check it out at bunnyluv.com. Wondering what type of litter to buy? Click here for important information about litter and your bunny's health. We hope you will find some interesting, funny or otherwise fulfilling information on our website. Should you have any suggestions for or comments about the site, please feel free to drop us a line! We'd LOVE to hear from you!